This project seeks to decode cat moods and thoughts into human language. Movements of the feline wearing the vest are assigned meanings based on how fast the cat is moving, or if the cat is moving at all. The cat vest reflects our understanding of non-human psychology back at us in our own words. Calliope is a recent graduate of OCADU’s Interdisciplinary Masters of Art, Media and Design,where she studied post-humanist and ecological theory, coyote biology, drawing, wildlife photography and design frameworks. She has a previous Bachelor of Fine Arts from the University of British Columbia where she studied photography and printmaking, and a Bachelor of Communications Design from Emily Carr University where she studied interaction, print design and typography. 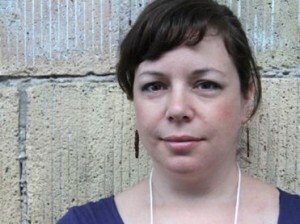 Calliope has been a designer and artist for the last eleven years. Before she came to Toronto to attend OCADU, she lived in San Francisco for four years where she worked as a freelance designer and web developer. During her time at OCADU, Calliope was a research assistant at the Social Body Lab, an OCADU research lab which focuses on wearable technology. For the summer of 2014, she will be participating in an apprenticeship farming program on Vancouver Island, where she will study food security and community supported agriculture.